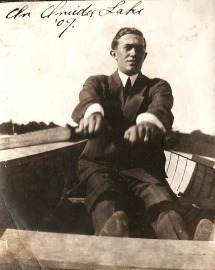 My grandfather, Howard T. Jones on Oneida Lake, 1909. Howard died in 1956 when I was just 6 years old, so my memories of him are vague. I do remember that he was an amature magician of sorts as he could make a coin disappear and then make it reappear from my ear - Grandfather also told me if I ate apple seeds an apple tree would grow in my stomach! 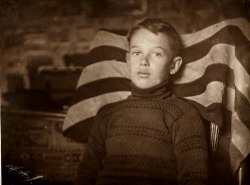 Grandfather Jones, 1910, 1 year after the death of his father, Frank Jones. Mable Jones (later married to Adelbert Oldfield) died in 1954. Other than stories my mother remembers her telling, I have absolutely no memories of her even though she frequently visited our home. Frank has a rather dubious past, as he had a problem with gambling and drink. 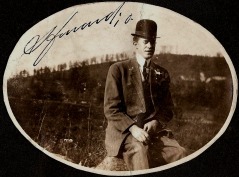 He died several days after setting his clothes on fire while sleeping in front of the stove in early January 1912. His mother, my Great-grandmother Mary Jones Dean was released (guarded by a Deputy Sheriff to keep an eye on her) from prison to attend her son's funeral. Frank is buried next to his mother at Daysville Cemetery near Pulaski, Oswego County, NY. 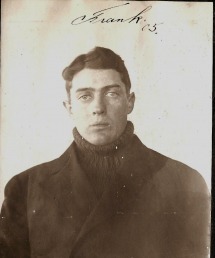 Perl, the youngest of 4 siblings (above) was convicted of grand larceny and sentenced in September 1920 to serve from 1 to 10 years in San Quentin, by a California judge. He was sent to prison (California) three times for various offenses, dying in a Veterans facility in 1941 near Cleveland, Ohio.